The implied significance of Banksy's work and how society has changed its perception of this work as "art". On the surface of this Banksy image, there is an obvious meaning stated by the text in the piece: “There is Always Hope” and as Banksy has said before, it is important for people to understand quickly because a lot of his work is only seen as a glance out of a car and therefore it needs to be understood immediately or it needs to draw the viewer to have a closer look. However, many of Banksy’s pieces have second meanings or jokes behind the meaning, and in this piece there appears to be a juxtaposition between the words and the image, because although the words state “There is always hope” the balloon just out of reach of the little girl appears to symbolise peace, happiness, innocence and dreams and yet it is not reachable by the girl who the viewer would assume would represent themselves. The assumption is that this image shows a love lost or innocence of childhood lost, and if it weren’t for the words on the wall there would be no question, however, the caption leaves the audience questioning what the real meaning of the image is, and wondering if the girl had released the balloon or is trying to retrieve it. Banksy buffed the wall underneath the little girl in order to make a stark contrast between the dark tones of her form and the bright red balloon, but left the wall under his words dirty, writing in a bright white. This could symbolise hope, showing that hope surrounds this innocent child, perhaps hoping for the love and dreams symbolised as the balloon, and then further along, perhaps the distance and the natural line on the wall between the child and the text represents time passing, in the darkest part of the wall, there is always hope. Banksy’s piece leaves the viewer with a positive feeling because of the words on the wall, despite how one might interpret the image accompanying it. Although simple, it is an image that seems to draw the viewer in again and again. There is a timeless quality to There is Always Hope, that seems to evoke our basic human needs and desires of love and hope, and this seems to be a universal feeling as the piece has been preserved behind perspex, as a piece of Art. 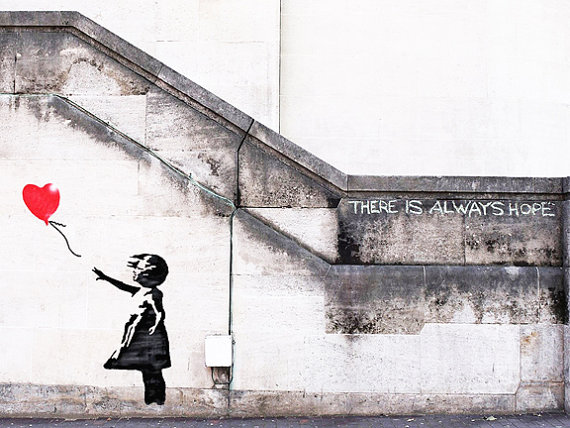 Banksy: "There is Always Hope... "